Warm sunny weather brings us excitement of the upcoming (hopefully) relaxing Summer Holidays. Well, some of us are busy bees and will continue to work this summer, for instance our instructors and our student's parents. That's why it is a great option to sign your child to the Summer Plein Air painting camp. We scheduled two weeks with full days from 10am to 3pm of painting, drawing and art social activities around Vancouver. Besides, you are able to bring your child earlier, or pick up later. Just talk to us about options, we are ready to help. Todays Kid's class was very productive. 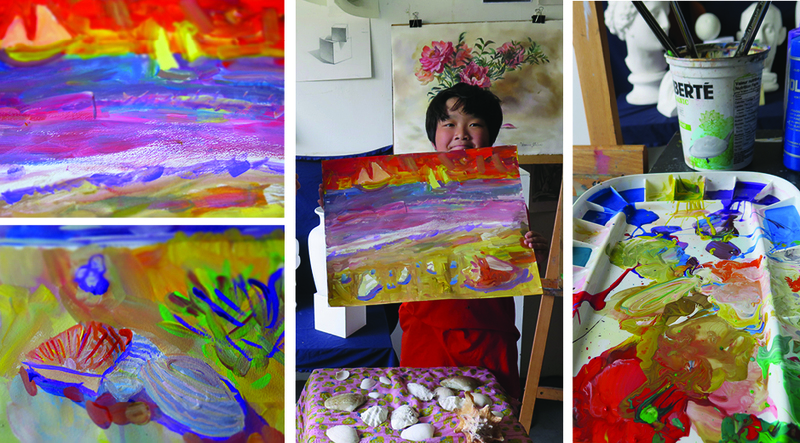 We painted Beach Landscape with "crazy" brushstrokes. Children are getting ready for outdoor painting, exercising bright colors and bringing themselves "out of basement", using full strength of palette.